What’s to see at Games, Gadgets, and Makerspaces? In less than a week, DC will become populated with innovative librarians at the Computer In Libraries conference. If you are looking for the best place to meet and greet librarians, stop by the Gaming and Gadgets night Sunday, April 6th at 5:30PM local time in the Georgetown room in the Washington Hilton. This year, the event is going to host over 20 different games and gadgets. Some of these games and gadgets aren’t even available for purchase yet. If having the opportunity to interact with something not yet on the market isn’t enough, there is also ton of awesome give-a-ways. This year, simply by playing and interacting with the gadgets in the room, you will be eligible to win a variety of prizes. From new technology that you can take home today to awesome swag prizes. Oh — did we also mention that there is some amazing refreshments there too? Robo 3D — Robo 3D is an amazing 3D printer with a prize tag well below $1,000. Take photos with the 3D printer for a chance to win your own 3D object printed. 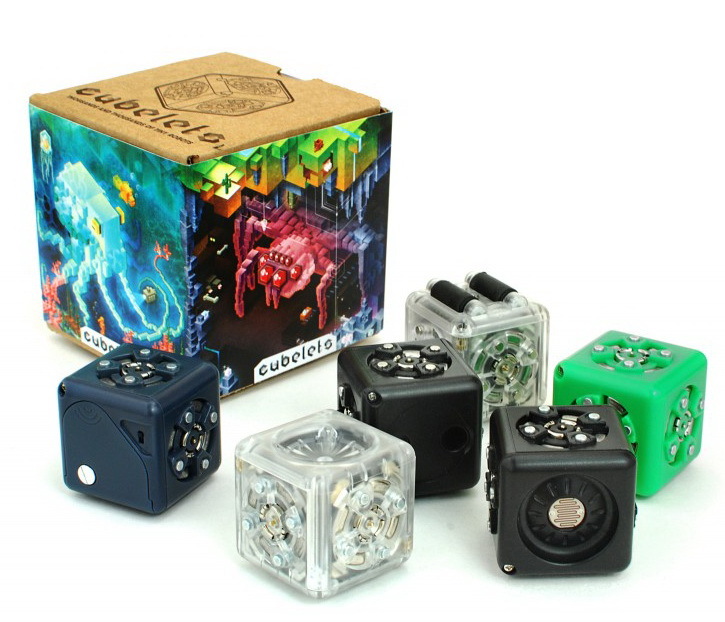 Cubelets — CUBELETS are magnetic blocks that can be snapped together to make an endless variety of robots with no programming and no wires. You can build robots that drive around on a tabletop, respond to light, sound, and temperature, and have surprisingly lifelike behavior. Complete challenges for a chance to win some awesome Cubelet swag. 3Doodler — The first 3D Printing Pen. Don’t want a giant 3D Printer taking up space? Well, create your own creation simply by drawing with the 3Doodler. Tiggly Shapes– Looking for something for your younger patrons? Tiggly is a great to any iPad collection to let children interact with physical shapes on the iPad. Tiggly helps develop spatial reasoning, motor skills, language, and creativity in fun exciting new ways. By simply playing with Tiggly and showing your excitement on twitter — you will be entered to win a FREE Tiggly Set. Circuit Scribe — Circuits more your thing? Well draw some circuits and make new connections, all on paper! Light things up and take some photos. You may be randomly selected to keep a circuit scribe pen, before they are even released! Empathy — Alright. That’s a lot of technology. We even have an amazing wooden block set for you to challenge yourself with. Challenging? Yes, because you have to work together with someone, blindfolded, and explain how you built your blocks so they may build the same creation as you. Vex — Speaking of building, play with the programmable robot kit. A cross between all the best block creation sets with an easy to use programmable interface, Vex allows you build amazing robots. Finally, but certainly not the last, if you love programming or interested in helping your patrons learn to code (which is a huge push across libraries and schools), be sure to experiment with Finch and the Hummingbird. Program an already created robot (finch), or build your own (hummingbird)! This is only a small snippet of what to expect at the gaming and gadgets session. If you need a break while at the show, be sure to sit and listen in amazing sound proof chairs or play with a giant interactive table. If you can’t make it to this amazing event, be sure to find the MakerSpace exhibit in the Exhibit Hall on Monday. The reception for that starts 5:00PM local time on Monday, so be sure to stop by if you want to enter in one of the many give-a-way contests. Join our gamers and gadget lovers for an evening of fun, playing, learning, and networking. See how you can transform your thinking, your programs, and your spaces with the latest games, gadgets, and ideas! Share with a poster about what your library is doing with creative making and makerspaces in your library. Led by Brian Pichman, Meg Backus, and Stephen Abram, this event will start your conference experience with lots of learning and laughing! Refreshments included. This month’s Searcher Magazine has a made a featured article “Survival Lessons for Libraries Staying Afloat in Turbulent Waters—News/Media Libraries Hit Hard” by James Matarazzo and Toby Pearlstein available free online. There has been quite a bit written about the fate of newspapers (and magazines) and the staffs that support them with respect to creating new publishing business models. Weaning the industry away from a model based on print advertising alone in order to arrive at a successful internet-based business model seems to be the overriding challenge. As recently as January 2010, the Financial Times reported that Alan Rushbridger, the editor of The Guardian, “described the financial effects of the internet on his newspaper … [as] sometimes quite scary.” 1 In discussing the viability of pay walls such as the FT itself now uses and will be implemented by The New York Times in 2011, the author points out that even if only a small percent (6% is quoted from an Outsell, Inc. study) of U.S. readers will pay for online news sites, this number alone could mean profitability and could provide enough data about subscribers to enable more targeted and therefore more sellable online advertising. 2 The kicker, if you will, is that specialized business publications like the FT and the Wall Street Journal have a better chance of survival because their business focus draws corporate customers. For the general newspapers to be saved, they will have to “take the plunge” and find a new way of doing business. Read the full article at Survival Lessons for Libraries: Staying Afloat in Turbulent Waters—News/Media Libraries Hit Hard. During Computers in Libraries 2010 we used QR Codes as an easy way for attendees to grab the URL’s for the many bloggers at the conference. For some folks, this use of the two dimensional encoding squares was old hat, and for others it was their first time seeing this 16 year old technology in action. After years of use in Asia, QR Codes use is increasing in the US as a direct result of widespread adoption of smart phones with bar code scanning capabilities like Android powered phones and the Apple iPhone. The simple codes we used are just the beginning of what QR Code technology can express. The code on the right provides a link to the website of one of the Bloggers@CIL2010 – if you don’t have a phone with a barcode scanner, you can use one of the free online decoders like this one from ZXing. Mark Sprague has written a very comprehensive post outlining QR technology and its many extensions and uses. Some of the designer codes he showcases are very cool. There are even QR codes with embedded graphics or company logos. I’d like to also thank Paula Hane, one of the LibConf bloggers and News Bureau Chief at Information Today, Inc. for featuring Mark’s post on Facebook since that is where I first saw it. Read it at Understanding QR Codes.